Amazon QuickSight is well suited in any organization that is making business decisions based on performance data whether it be Marketing, Sales, Call Center, etc. It is a great tool especially for mature organizations that have a lot of data to work with. Amazon QuickSight may be not as well suited for newer organizations that are just beginning to drive data/performance metrics. The data available becomes more and more valuable to more that you have. The only scenario where I would not suggest Treasure Data, is either in organisations which are too small to pay the fee and must resort to open source solutions, or organisations so large and sophisticated that limitations around workflows and connectors are more critical than the overwhelming efficiency saving.TD is good for any team which does not wish to invest significant resources in developing and maintaining their data infrastructure. Even teams with dedicated Data Engineers should benefit from those engineers working on more interesting issues than "keeping the lights on". Amazon QuickSight is a really easy program to learn how to use. Amazon QuickSight allows our team to customize the data using the various data sets, which makes the available reports incredibly powerful to our organization. Our organization has the ability continually adjust our reports and build new reports as business needs change. Even though our organization has different reports built for different departments, each department can still access and understand reports from across the company. Support -> Absolutely outstanding support, I have never had an issue which has been put in the "too hard, cannot fix, work around" pile. One of the primary challenges I've had with Amazon QuickSight so far is that some of the reports I want to build use data from different data sets. Instead of being able to put all of the information I want to see into one report. Some of our Amazon QuickSight reports only update every 24 hours. It would be great to see that data in real-time. I would remove the various time zones from Amazon QuickSight and only use the time zone we are in. I like TreasureData's UI, it's clean and very useable. Support has always been very responsive and digs in to help solve any problems. They have a great approach with both beginner users of the product as well as with more experienced users with more in depth questions or challenges. Implementation was quick and our developers had very few issues with the SDK. This is where everything gets lost in translation. 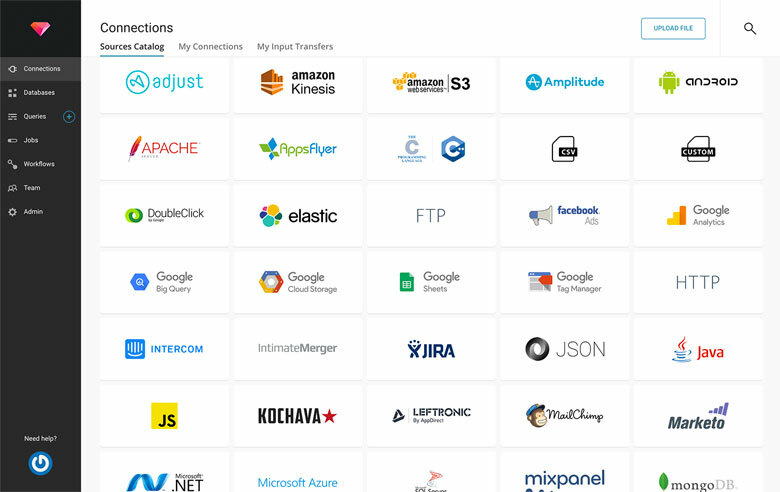 There is not a competitor that offers an end to end data services solution capable of managing etl , end-user adhoc usage, data delivery, warehousing, app sdk, WORKFLOW with digdag and so much more. Let’s not forget that all this sits on Hadoop storage designed to easily manage terabytes of data. On Treasure Data’s platform. We have close to 100tb in use daily. Treasure Data allows our data analysts to compute a huge size of the data set which they couldn't handle on the relational database previously and accomplish more complicated data analysis. It helps our executives and product teams make a decision more confidently based on the result of the analysis. Since Treasure Data is a managed service, we can focus on the data analysis. We have more than 100 tables updated daily basis on Treasure Data but still, we don't need a dedicated data engineer for the maintenance. It's a huge cost saving. Treasure Data's support engineers are very knowledgeable and supportive. When our queries don't perform well, we always ask them to give us suggestions for optimizing the queries. One day, they improved the processing time of a query from 3 hours to 1 min. It was a mind blowing experience for us. Being able to access to their knowledgeable engineers are invaluable.